After all, we’re writing stories, not casting a movie or play. Right, but see, here’s the thing: too little description can leave readers struggling to connect while too much description gets boring/overwhelming. Knowing all the details of what a character looks like by having a readily available picture of him/her allows us to find a balance between too much and not enough description. We’re not having to try to figure out what the character looks like by writing down every detail that comes to mind because we can see them so clearly in our heads and we don’t want that image to disappear, and we’re not abandoning description altogether because we really don’t know (or care) what the character looks like anyway. However, even we visually oriented types have to keep something very important in mind: Physical description is not character development. It’s the giftwrap on the package. And the level of physical description offered in a story varies by genre. Typically, romance, fantasy, and science fiction genres will have much more, and more specific, descriptions of the characters’ physicality; while mystery may focus only on what’s important (or what the writer wants the reader to think is important) to solving the case. Thrillers, action adventure, and even horror can be sparing with descriptions, using the bare minimum to draw the reader into the character’s peril or heroicism. After many, many years of doing this, I’ve narrowed my methods down to four. Yours may be one (or all) of these, or you may have a different way do to it. There is no right or wrong way. Do it the way it works best for you—or don’t do it if you find it’s distracting rather than helpful. You already have an idea of what the character looks like and you go on a search for someone who fits. For example: I have a story idea. I know my heroine just turned 40 (because the story hinges on that). She’s from a big Southern family. I want her to be plus-sized with dark hair and dark eyes, somewhat tall. She’s a scientist/genius—but not the stereotypical short hair, lab-coat, and horn-rimmed glasses female scientist. But because of her physical presence and her genius-level intellect (and the fact she’d finished two PhD’s by the time she was twenty-eight years old), men tend to be intimidated by her. As soon as the idea for a character comes to mind, you immediately shop for a RWT to develop the character from. For example—you know you want a character who’s a certain age and certain ethnicity—but you really aren’t sure about anything else. You “shop” around until you find the RWT that speaks to you. It wasn’t just seeing an image of Paul McGann in this uniform that inspired the entire Ransome Trilogy. 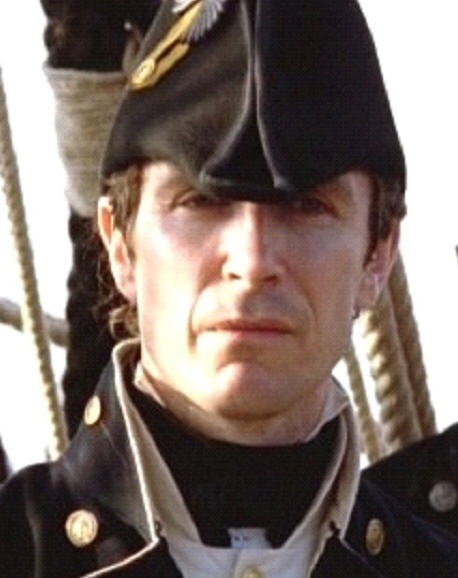 It was seeing Paul McGann in this uniform as Lt. William Bush in the Horatio Hornblower movies that inspired the entire Ransome Trilogy. You see, had a different actor played this role—one without a voice and accent that is like bathing in melted chocolate for the ears, one without those impossibly fathomless blue eyes—I might never have become obsessed with the character of William Bush. And I might never have fixated on the line in Duty (in the scene here, starting at 1:45) when Bush says to Hornblower: “In my opinion, sir, there’s never a good time to get married.” Which, of course, made me take pencil to paper and start figuring out just what kind of woman it would take for William Bush (soon to be rechristened William Ransome) to change his tune when it comes to getting married. Ah, there’s that term . . . casting book. Which we’ll get into tomorrow. But for now . . .
What methods do you use/have you used in the past to cast your characters?